Publication Date 6th September 2019. 192 page A4 Hardback illustrated throughout. Steve Clarke has been a guitar technician for over thirty years and during this time he has re-fretted, repaired, altered, customized and created relic lookalike guitars. He is totally passionate about what he does and this is reflected in every job he undertakes. 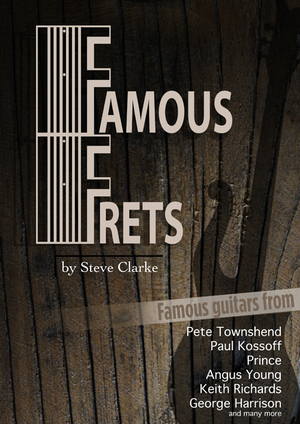 Famous Frets takes a look at some of the recognisable guitars Steve has worked on. Guitars used by some of the biggest names in rock music from Pete Townsend and George Harrison to Prince and Keith Richards. Steve has worked as an advisor to Bonhams on vintage and collectible guitars and has written articles for The Guitar magazine. In Famous Frets he attempts to find out why the iconic guitars favoured by famous historic musicians sound the way they do and to establish whether custom parts were fitted. Over the decades, the guitars issued by Fender and Gibson changed, sometimes due to shortages of materials, other times the change was down to new manufacturing technologies. The outcome was not always for the best! Steve’s unique situation has allowed him to pull the guitars apart and examine them in detail. Backed up with high quality photos of each instrument, Famous Frets gives both guitar fans and fans of the musicians an incredible insight into the instruments that helped shape and define their music.